Mangaluru, Apr 21, 2018: Coastal city of Mangaluru, is a processing centre for imported hydrocarbons and this can be a highly volatile matter in the city. 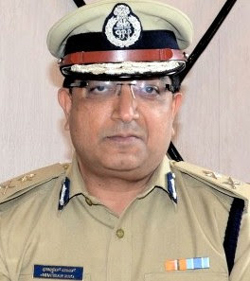 The enemy anytime can use the situation to advantage, said Bhaskar Rao, ADGP, Karnataka State Reserve Police (KSRP). “This is not due to the lack of fire-fighting facilities, but they are not commensurate with requirement,” he added. Rao made the shocking revelation during a conference on ‘Coastal security: Challenges and concerns’ at Mangalore University. It was jointly hosted by the department of political science of Mangalore University and The Institute of Contemporary Studies (Bengaluru). The event was attended by experts in coastal security and IPS and IRS officers. Rao, who was closely connected with coastal security, an emergent area of shallow waters policing in the aftermath of Mumbai terror attack, said that India has been compromised in this aspect right from 1st century BC, “but we have woken up only after 26/11”. “In spite of this, there has not been much change. There have also been accidents in the sea of late,” he said, citing the recent examples of a sailing boat with Russian couple that drifted close to Mumbai harbour and foreign ship hitting a fishing boat off Thiruvananthapuram coast. Even though the country has all security aspects covered, some forces are bent on disrupting the smooth running of the country by acts of terrorism, hit the economy interest by bringing in fake currency, gold, narcotics, weapons and pollute territorial waters. “Fisheries Act is more or less a toothless tiger and obsolete. It is more in violation than enforcement due to lack of trained manpower and infrastructure. The identity cards issued to fishermen without any electronic readers is waste of resources,” Rao said. “Several states don’t have Maritime Board which addresses several issues of the coast under the subject of the State List and Concurrent list. When it comes to marine environment, it’s totally neglected,” he said, adding that there is no mapping, no enforcement and no regulation. “None, including the forest department, considers undersea environment as flora and fauna. This is rampantly poached and vandalised by high-power trawlers. The sea also has become an underground dumping yard for untreated sewage, chemicals and hydrocarbons,” he pointed out.